Robert W. (Bob) Karlovich has over 42 years experience in the sales and marketing of commercial and personal lines insurance. His specific areas of expertise are energy, construction and transportation risks. Bob is highly skilled in assessing his client’s insurance needs and offering coverage solutions. Bob prides himself in providing unparalleled customer service. 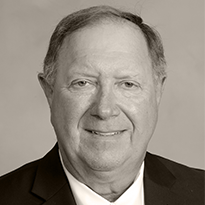 Bob is an active member of the Tulsa community, serving on several boards, including The Scott Carter Foundation, Independent Insurance Association, Cedar Ridge and Oaks Country Clubs, Tulsa District and Oklahoma Golf Association and The Berwick Homeowners Association. In Bob’s spare time, he enjoys coaching middle school basketball, playing golf, cooking and spending time with his family and friends.